The MSHS Spring Garden Gala has been the must-attend spring event for gardeners for several years now. After a bit of tweaking, we’re going back to our original format and location — and you can reserve your seat starting tomorrow–Saturday, Dec. 1. The 2019 Spring Garden Gala will be held on Thursday, April 4, at the Lake Elmo Inn in Lake Elmo, Mn. The event is a luncheon and will feature a show-case of some of the newest and best plants to grow in northern gardens. This fun event also includes drawings, giveaways, a chance to talk with fellow gardeners and many garden gurus, as well as a delicious lunch from the Lake Elmo Inn. 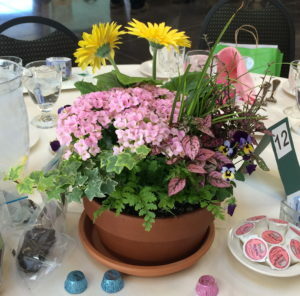 The Spring Garden Gala is also an important fundraiser for MSHS, helping us to provide the gardening information we do through Northern Gardener magazine, our classes and events, as well as supporting special projects that promote community gardening such as Garden in the Box and Minnesota Green. The garden gala has sold-out quickly in the past, so get a group together—a couple of friends, a garden club or book group, fellow community gardeners—and reserve your tickets for this event. Tickets cost $55 for MSHS members and $65 for nonmembers. You can also get discounts on a table of 10. We hope to see you at the gala!